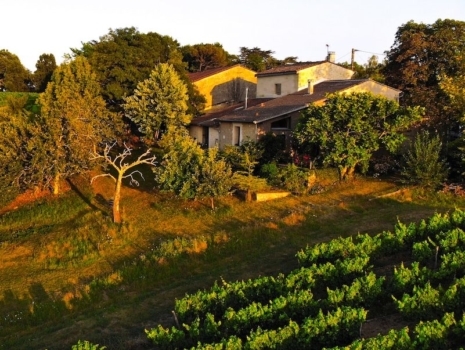 Enjoy a unique French immersion in the heart of the Bordeaux wine country. 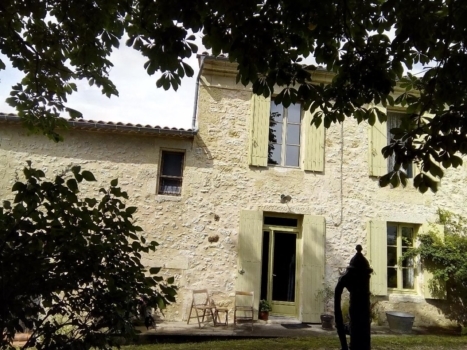 French teacher Edwige will welcome you and your family/friends in the privacy of your own cottage, adjacent to her country house. 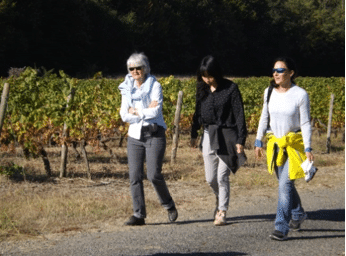 Discover the beautiful colors of the vineyards along the seasons, visit gorgeous châteaux and medieval towns and practice your French while sharing a glass of wine with your dedicated French teacher. Bonjour et bienvenue! Je m’appelle Edwige. Since I qualified to teach French as a foreign language in 2005, I’ve taught in various countries: Morocco, Australia, New-Zealand, Norway, Belgium and the UK. If you want to learn French for pleasure, enjoy speaking French whilst visiting France or perhaps preparing for a more specific purpose, like working or studying in France, I will adapt my lessons to your needs. I can help unlock your full potential by providing the one-on-one attention you need in order to succeed! My husband Jonathan is British born but his French is good. He works abroad but comes back often so you may get to meet him. I live about 40 km away from Bordeaux in a tiny rural hamlet. It’s a very nice walk in the middle of the vineyards to the nearest village. It is a pretty medieval village, with lots of history, shops, restaurants, a great bookshop/cafe, a wine museum, as well as a cinema and an open-air pool in the summer. You will find everything you need there, and many opportunities to practice your French with the locals. There is an open-air market every Saturday morning where I often buy fresh produce. Since my house is uphill from the village, my students often enjoy walking there and I pick them up in my car for the return trip. Our home is an old winemaker’s house built at the beginning of the 20th century. It still has old time charm, but with modern comforts! We have a newly built cottage attached to our house where you will have your own accommodation. It’s on two floors. The garden level features a comfortable living room with a sofa and a TV corner. Your cottage has a fully equipped kitchen and dining area. I love everything about food! Reading, cooking, eating, and also, of course, talking about it! I’m a qualified dietician, and I enjoy cooking simple but tasty meals, using excellent quality local produce. I often cook duck or free-range chicken along with fresh organic vegetables from the local market or our garden. I love to combine local produce with aromatic herbs and accompany them with a nice local wine (Bordeaux of course!). I will also be happy to adapt my food to your special diet: I can cook vegetarian and will do my best to cook vegan, gluten-free or whatever your diet may require under your guidance. You have your own private terrace overlooking the vineyards, allowing you to choose when you want to have a bit of peace and quiet on your own! The view is not bad either. The master bedroom and shower room are located on the garden level. 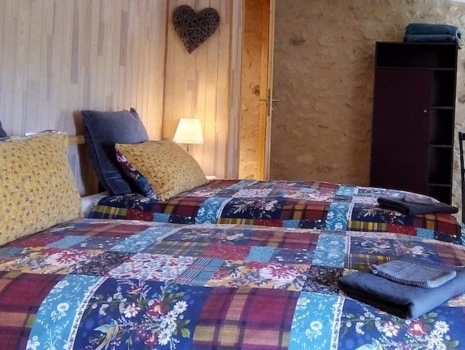 You will enjoy a comfy king size bed and a shower room. Upstairs, there is a second bedroom with 2 single beds and its own separate toilet. Wifi is available throughout the house and we have a good mobile coverage. Unfortunately, there are no pets allowed on the property and no smoking inside the house either. Our region of France is called “le Bordelais”: it takes its name from the main city “Bordeaux”, recognized as a UNESCO World Heritage Centre. 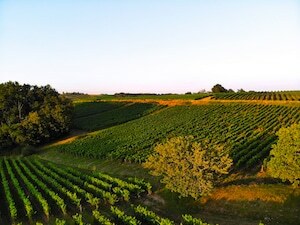 My house is in an area located between two rivers, therefore also called “l’Entre-deux-mers” (between two seas): it’s a luscious region full of fields, rivers, vineyards and medieval villages called “Bastides”. You will find lots of information about the region in your cottage, but there is also a tourist information center 5km away in the main town where you can also visit a castle and a wine museum. There are plenty of options to get to my place. Trains, planes, buses: the Bordeaux region is very good for public transport. From Paris is the new high-speed TGV train line to Bordeaux center, which only takes 2 hours. There you can change train and in another 20 minutes, you arrive at the closest train station where I will be waiting for you! Bordeaux airport is connected with lots of European cities. From Bordeaux airport, you can connect to the train station to come to me (there are direct buses every hour between the airport and the train station). If you love nature and the outdoors, then there are plenty of nice walks to do around us. I also don’t mind to go and pick you up after a nice long walk or drive you to the closest village or the train station. If you want to be more independent and to discover the area on your own, we suggest renting a car. There’s a parking space right next to your cottage. 7 days – 6 nights, usually from Sunday to Saturday but I can adapt to your travel needs. This is a suggestion for your immersion program, but I’m also happy to adapt to your rhythm and create a personalized schedule. Given the size of the cottage, we can easily accommodate 1 or 2 persons but are also flexible for families or group of friends up to 4. I’m easy-going, very flexible and I like my lessons to be lively. I enjoy teaching pronunciation, grammar, the use of different tenses, as well as conversational classes, but could also help you prepare for a French exam, or develop precise work-related French skills. I like learning to be fun, so I use many different books and methods, and I especially enjoy using games and videos to help in class. 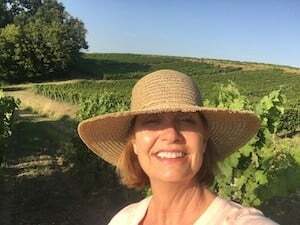 Moving to this exceptional region of France has been my dream for many years: now, I can’t wait to share with you my latest finds, stroll the medieval cities and open-air markets together and then share our impressions of it all – in French of course – over a glass of Bordeaux wine! 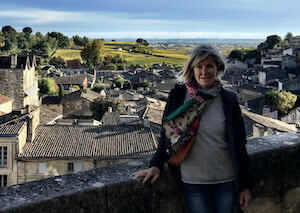 Follow Edwige’s Bilingual Articles On French Today, Where She Talks About Her Beautiful Region. 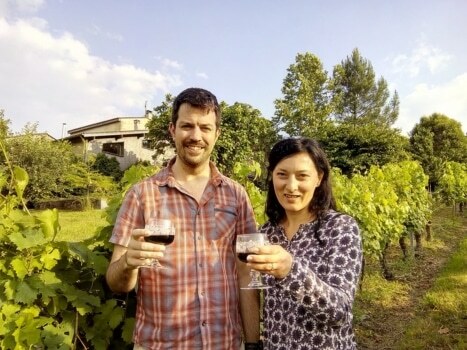 I spent a week with Edwige in her beautiful cottage in the middle of the vineyards, and I couldn’t be more grateful for the wonderful experience I had. Edwige is both a great teacher and person, she is so perceptive and thoughtful about everything which instantly made me feel comfortable around her. For our lessons, Edwige usually adapted to the mood of the day and kept things interesting with a variety of interactive games and videos. I also found her to adapt to my pace whilst being mindful about my lack of confidence in speaking, which over the course of the week improved considerably! But what I most appreciated about Edwige as a teacher was that she equipped me with tools and techniques to continue learning the language even after leaving the immersion. Speaking of the place, I was so amazed by the beauty of this tiny village and was so happy to have my own little private cottage for some down time which I otherwise struggle to find in my day to day life. It was so peaceful being with nature and I felt so recharged being in the midst of the beautiful vineyards, and to my own surprise was always amazed how quickly the day passed by. It was also so wonderful to visit nearby towns on our weekly excursions and Edwige was like a private tour guide! I was amazed at how much she knew about the history of the surrounding villages. 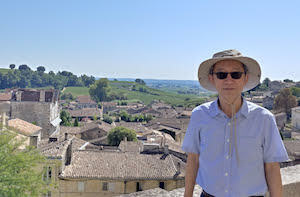 I loved visiting Saint Emilion in particular, and I really hope to find myself back to Edwige in her beautiful village again next year. I am so glad to have done this immersion and recommend it to everyone interesting in learning French authentically. 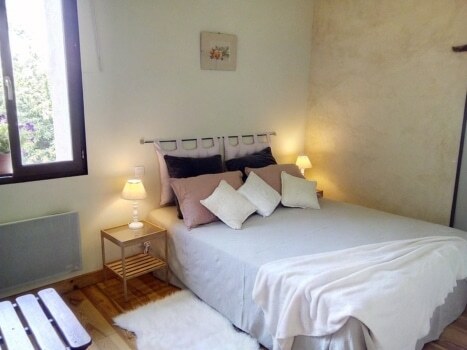 Because of my extremely limited grasp of French and my self-consciousness due to that, I embarked on a home-stay immersion with some trepidation. But it was very important for me to try. I have always regretted the fact that I couldn’t even engage in small talk with citizens in one of Canada’s official languages, and I set about to remedy that. I selected Edwige, based on the excellent website reviews of her by former students and her detailed self-descriptions. We exchanged emails, and I was immediately impressed by the thoughtfulness and care of her responses. The fact that she was happy to work with beginners was also a big plus. Further, I was attracted to the privacy and independence her accommodations offered and charmed by the opportunities for long walks in picturesque surroundings, where I imagined myself quietly contemplating my newly-found verbs and nouns. To say I was overwhelmed by my week with Edwige in her charming gite is an understatement. I honestly could not have imagined that I would arrive barely capable of uttering a “bonjour! ca va?” and leaving with a functional ability to converse in a friendly way with a French-speaking citizen! I was absolutely over-joyed and, perhaps most important, motivated to continue my studies, all due to the persistent, encouraging and supportive energies of my gifted teacher. Others before me have detailed the considerable extras that come with a stay with Edwige: the day trips; her cooking skills; the cleanliness and comfort of the accommodations; visits by the dogs and cats of her little village; the views from her kitchen; the bird-songs that often accompany one’s lessons. All of which added to what for me, and others who had the pleasure of learning from her, was a truly transformative experience. Merci beaucoup, Edwige. Merci de m’avoir appris, pas seulement à propos de toi, mais à propos de moi-même. Many thanks for a great week. 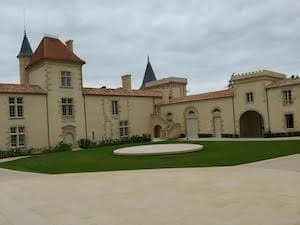 It was a full-on experience with a good mix of daily lessons at the table, speaking games during walks in the lovely countryside, listening to tour guides and chatting during the excursions to St Emilion and local chateaux etc., general conversation at mealtimes as well as watching films and TV in French. I felt that I not only learned more French but gained in confidence by using the French I already knew. By being immersed in French, the words and phrases seem to bubble up to the surface and became natural to use rather than having to think about translating from English. Looking forward to using my new-found skills on my next trip to France. I have had an affinity for French since I was introduced to the language as a boy growing up in the midwestern US. But I never learned to speak French conversationally, and when I first found myself in France in 2008, I was dumfounded. And that was after taking several months of courses at the Alliance Française de Denver. 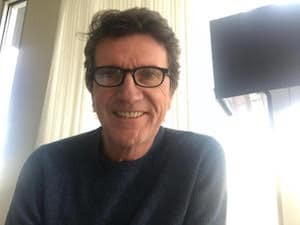 I took a leap of faith this year after I returned from my second trip to Paris when I made the decision to return to France and treat myself to an immersion course in Bordeaux. It was one of the best vacation choices I have ever made. Edwige’s home and guest house are situated perfectly amidst the rolling vineyards that define this world-famous wine country. And I could not have been more delighted with my tutor! Edwige has a rare talent for teaching her native language. She makes learning French fun, which together with the course she put together for me, advanced my conversational ability to a degree that I didn’t think was possible in the six days we studied together. And like every good teacher I have known, Edwige is also an inquisitive student. When she discovered that I had brought my meditation cushion, she invited me to teach her to meditate, and we began each morning together in a guided practice. J’espère te voir en 2019, Edwige! Even for those with quite an advanced level of French there is an element of “use it or lose it”. Much of the time I spend in France is with English speakers, or mixed groups that default to English, and I find it difficult to get the time alone with native speakers to keep and improve my fluency. 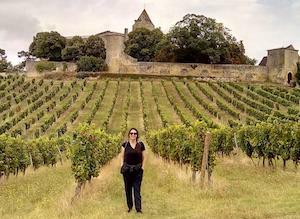 So, this was the goal for my week with Edwige in the countryside outside Bordeaux. Edwige was incredibly welcoming and so easy to talk to that the time just flew by, so much so that I hardly noticed the improvement I was making until the very end. The methods were many and varied but always fun and engaging. My abiding memory will be playing Taboo together while walking through the vineyards enjoying the last rays of autumn sunshine and coming home to prepare a simple but delicious lunch that we ate under the horse chestnut tree in the front garden. 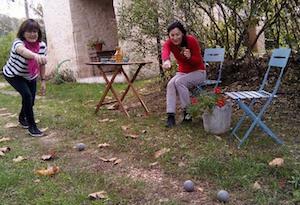 As the weather was still being kind to us, we even managed to fit in a game of boules. The accommodation is simple but very cosy. You will have everything you need plus a fantastic view of the sun setting over the vines each evening which in summer you can enjoy from the dining table in your own little garden. To make the most of all the area has to offer, do rent a car. 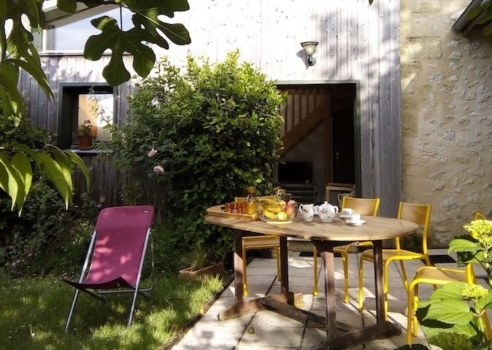 This will allow you to explore the region independently of the excursions you will take with Edwige – a trip to St Emilion perhaps, or a bike ride along one of the canals that border the Garonne. 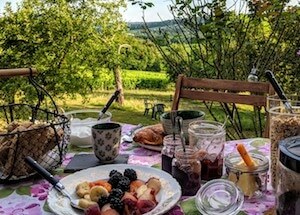 Whatever your level and whatever your reasons for wanting to try a French Immersion Homestay, I thoroughly recommend it. Edwige will ensure you get the most out of your stay with her and you will not regret it! It was a thoroughly rewarding and enriching experience. Merci, Edwige, du fond du cœur. Like many others, my daughter in law and I were not quite sure what to expect from the French lessons. But within minutes, Edwige had accurately assessed our levels of French and she tailored the work carefully to encourage our progress. Three hours at a time is quite an undertaking. However, the lessons were structured but light-hearted, challenging and varied. She was always well prepared but flexible when something arose that needed addressing. She made sure we were comfortable and well fed, the excursions were useful and imaginative, including a lesson en plein air! Afterward, I felt more confident about approaching shopkeepers, waiters and cashiers. I was less afraid that people wouldn’t understand me, and I was better at understanding them. Although I still have a long way to go before I am satisfied with my spoken French, I certainly made progress. We were sad to leave. A thoroughly enjoyable week. 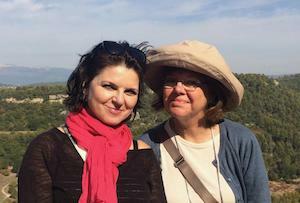 I recently spent 2 weeks studying with Edwige, and I found it to be a very rewarding experience, both as an older but serious student of the language and as a visitor to this region of France. Edwige gave me some very valuable advice that addressed my needs specifically. I had previously expressed my desires to several teachers I had met personally and online but this was the first time that someone gave me advice that I am convinced will aid me in reaching my goals. I am very grateful for her insights and now it’s up to me to put her advice into regular practice. 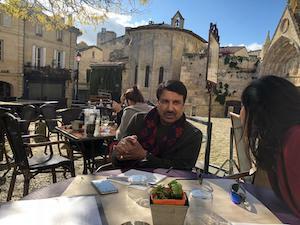 As a visitor, I thoroughly enjoyed my excursions to St. Émilion and to the former homes of Toulouse-Lautrec and Montesquieu, where I was able to join groups of French tourists led by a guide. Edwige made notes during the guides’ presentations and reviewed with me some of the more historically interesting or linguistically difficult points afterwards. Having lived only in huge metropolises of more than 10 million people during the past 4 decades, it was a very nice break for me to spend time in the tranquil, bucolic surroundings of Edwige’s very comfortable home, with vineyards stretching farther than the eye could see, and with chirping insects and tweeting birds the only sources of sounds (aside from the occasional quiet hum of a distant grape harvesting tractor when I was there). And what incredible stars in the night sky! What a magnificent reminder they were of nature’s grand beauty to this city dweller! 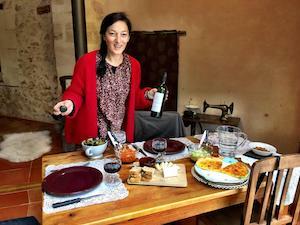 All in all, if anyone is interested in improving their French language skills while simultaneously soaking up the culture and landscape particular to this region of France, I cannot imagine a better option than to sign up for this immersion program with Edwige. Our week with Edwige was delightful. The relaxed meals were delicious, thoughtfully prepared and our meal times were filled with conversation, en français, of course and with so much laughter. Edwige is calm, well organised and so very easy to be with. We enjoyed her company immensely. Our cottage was very comfortable, well equipped with a tranquil garden overlooking the orchard and vineyards. 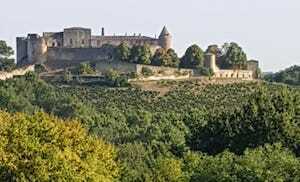 While I studied, my husband Paul borrowed one of Edwige’s bikes and explored the rolling countryside. 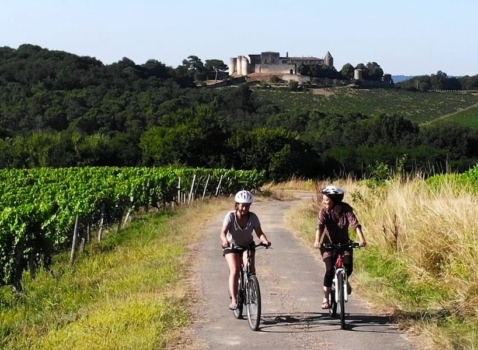 There are a number of villages within biking distance and he reported back on the vendange which began the week we arrived. One morning we biked to the Maison des Vins 5km away. This is well worth a visit. 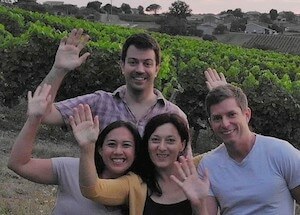 We learned a lot about the Entre-Deux-Mers region and the wine produced there. And yes, we managed to bike home up the wee hills after enjoying a wine tasting but I am sure Edwige would have collected us if we needed her to. Because our seven-week stay in France has been quite intense we were happy to choose relaxed outings with Edwige. 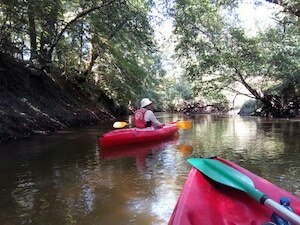 On a hot summer’s afternoon, the quiet canoe down the river under shady trees was a good choice. In Bordeaux we wandered along the banks of the Garonne and viewed some of the city’s notable landmarks such as the Palais de la Bourse, The Cathedral and the spectacular Monument aux Girondins. The latter is a memorial to the Girondins who fell victim to the Reign of Terror during the French Revolution. Le Musée d’Aquitaine has extensive coverage of part Bordeaux played in the slavery system in the Caribbean. This was a very informative and sobering exhibition. My lessons did not often feel like lessons at all. The games prompted me to speak French, to seek out and use the vocabulary and grammar that I had previously learned. The video clips, reading articles and topics for discussion were both provocative and interesting. These challenged me to extend my vocabulary and also to realise that I had a bigger French vocabulary than I thought. Edwige is an excellent teacher. She patiently corrected my errors and encouraged me to attempt conversations I would never have thought possible. This was a very special week for us. Thank you Edwige, we hope to return someday soon. What a wonderful experience it was to spend a week with Edwige. It was the perfect French getaway. This year I had to find time to squeeze French lessons into my rather packed schedule and so I took one of my weeks of vacation for immersion French. I was a bit concerned I would leave more exhausted than I already was when in fact I needed both to improve my French and have a holiday. I can say definitively after my stay with Edwige, it is possible to both recharge and study at the same time! The classes were exactly what I needed, when I needed them. Because the classes are one on one with the teacher, the lessons were tailored to my exact needs. Over the course of the week, Edwige was able to see what mistakes I made systematically and create a plan specifically for my needs. We worked on my pronunciation and vocabulary and the kinds of systematic grammatical mistakes I made. However, I learned as much during the meals we shared and the trips out we took as I did in the classes. Throughout the week, Edwige diligently corrected my mistakes and helped me improve my ability to speak correctly and with confidence. The living arrangements were ideal as well. 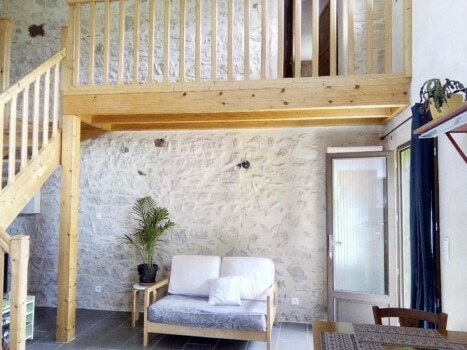 Edwige has a picturesque farmhouse which has been split into the main house and a little cottage with its own entrance for students. 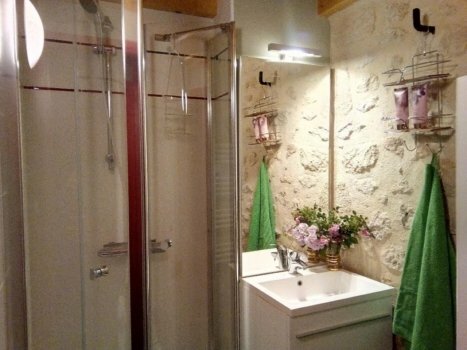 It is perfect as you have a real immersion experience, but you also have your own space for privacy and relaxation. It feels like a quaint bed and breakfast but with privacy and ample personal space that includes your own kitchen and bathroom. The food is prepared with care and presented in a style that made me think of French rural chic. I have to add that Edwige seems to be particularly accommodating to dietary restrictions. As a vegetarian who travels a lot I find it is not always easy to both eat locally and vegetarian during my travels. Edwige prepared balanced, varied vegetarian food that was prepared with local ingredients during my stay. It was amazing. The small towns around Bordeaux are serene and thoroughly relaxing. I was thrilled to find a wonderful balance of excursions that were culturally enriching as well as physically active. 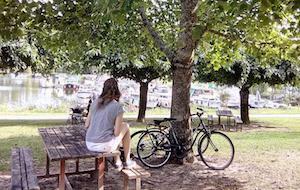 My favorite visits included the guided tour of the home of Toulouse- Lautrec and biking along the river. By the end of the week I achieved my goal to begin to think in French and even had my first dream in French. I wholeheartedly recommend Edwige as a teacher and can only say my entire stay was wonderful! I am working with the United Nations and wanted to improve my French for professional purposes. I just completed my French Immersion Programme with Edwige in Bordeaux and I am very, very happy with the result. The week was fantastic and Edwige is an amazing teacher. It was a wonderful experience and my expectations have been surpassed tremendously. With Edwige’s excellent teaching, I was able to make remarkable progress in my French skills and was able to have conversations on various complex topics at the end of the week. Edwige is an incredibly kind and patient teacher, while also challenging you to grow and to reach beyond your capabilities. Edwige was able to both adapt to my needs and provide me guidance in targeted areas that require improvement for my professional growth, while also identifying gaps in my knowledge and building on those. My week with Edwige was wonderful! Her hospitality and friendly nature (personality) immediately put me at ease. Edwige offered flexibility in the class schedule but I enjoyed the routine of morning classes. (following a delicious breakfast) Edwige is a professional and experienced teacher of the French language. She quickly determined my strengths and weaknesses. We focused on pronunciation, listening skills and tips to expand my conversation skills. Using games, audio recordings and some grammar lessons the time flew by as I was learning and getting more comfortable speaking. Of course, there is much more to learn and Edwige gave me resources and guidance to help with that. I am pleased to recommend Edwige. It was a great week! My husband and I decided to take a year sabbatical from our corporate jobs to travel. As long-term travelers, it was important for us to have enriching cultural experiences as opposed to just a sightseeing vacation. I read about a French immersion homestay and thought that would be a perfect opportunity to explore a new area, improve our French skills for our travels, and have an authentic experience of French life. We couldn’t have chosen a more perfect homestay for the week. From the moment of contact, Edwige was communicative and answered all our questions. We arrived to a warm welcome and absolutely stunning property! 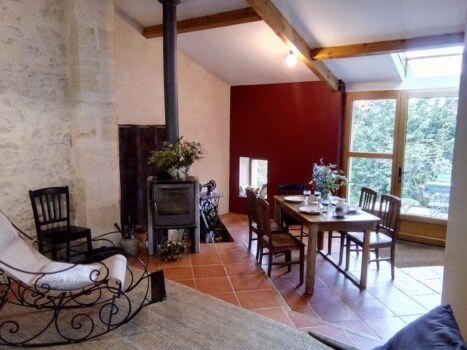 Edwige’s home is located in the Bordeaux region with vineyards, chateaux and medieval towns surrounding you. The private cottage is clean, intimate, and thoughtfully designed with everything you need, including a lovely patio where you can enjoy a glass of wine, book and watch the sunset each evening. She also has bikes you can take to explore the area on your own. Edwige is passionate about her job and cares Bout her students’ progress. She is an extremely talented teacher who was successful at balancing two different levels throughout the week, without compromising our experience. The classes flew by and were filled with a variety of activities that improved our grammar, listening, speaking and vocabulary. My husband loved the games she used to make the lessons fun and interactive. Edwige has a flexible and encouraging teaching style, which kept things interesting and made us feel at ease. One important point I noticed was she has strong intuition on when and how far to push her students. Outside of class hours, Edwige was available for a chat in French over a glass of wine or coffee, but she was also respectful of private time. 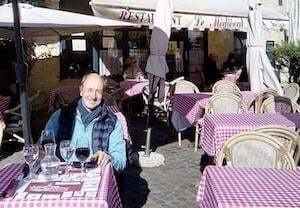 The meals were healthy and delicious, and we had two wonderful excursions – one to a small winery with a private tour and tasting, and the other to a medieval town, Saint Emilion, where we wandered the streets, sat at a cafe and spoke french together like old friends. If you’re considering this program, I hope you do because it will be one of the most remarkable travel experiences you have. Thank you Edwige for sharing your home with us, we hope to return someday soon. In October 2017 we spent a week of French immersion with Edwige in the South of France. The experience was educational, fun and one we will never forget. Our accommodations were very attractive, private and comfortable. The common area was clean and bright and very conducive to socializing and studying with Edwige. We spent three hours each morning working on French grammar and speech. Edwige was very good at identifying our level of expertise (or lack of) and customizing her instruction to meet our specific needs. She used a wide variety of methods with emphasis on developing listening and speaking skills. There were written exercises, games, audio lessons, and conversations. On two afternoons Edwige took us on excursions to nearby places of cultural and historic interest. What made all of this experience especially wonderful was Edwige herself. We found her to be a wonderful hostess and teacher who presented learning with patience, sympathy and humor. And finall,y we must mention that she is a wonderful cook who prepared delicious meals. We would recommend anyone who wants to take their French studies to the next level to consider studying with Edwige.